Brahms gorgeous setting of today's psalm. Even Your altars, O Lord of hosts, My King and my God. Nearby stood six stone water jars, the kind used by the Jews for ceremonial washing, each holding from twenty to thirty gallons. 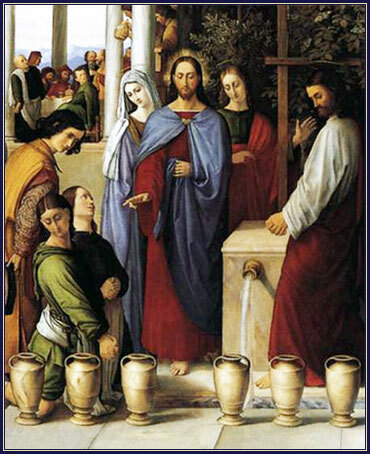 Jesus said to the servants, "Fill the jars with water"; so they filled them to the brim. The master of the banquet's remark, that usually the best wine was served first, but at this wedding the best wine had been saved until now, is symbolic of the coming of the Messiah. The wine represents spiritual life that comes from God's relationship with humanity. When Christ comes, God serves His best wine. Water, the substance upon which human life is based, and the jars of water represent humanity. God has not only transformed the water into something much better, represented by wine, but he has saved the best for now. He has had a spiritual relationship with the Hebrews for millenia by this time, just as people have had wine to drink for celebrations; now, however, the best and greatest wine has been served, in the person of Jesus Christ.